An interview with Durham-based artist, Kate Van Suddese. Kate describes how she is inspired by the North East coast and the different artists who have influenced her work and passion. Part of a continuing series exploring the work of artists, photographers and other creative people in the North East. ‘Sea Kiss’ by Kate Van Suddese. 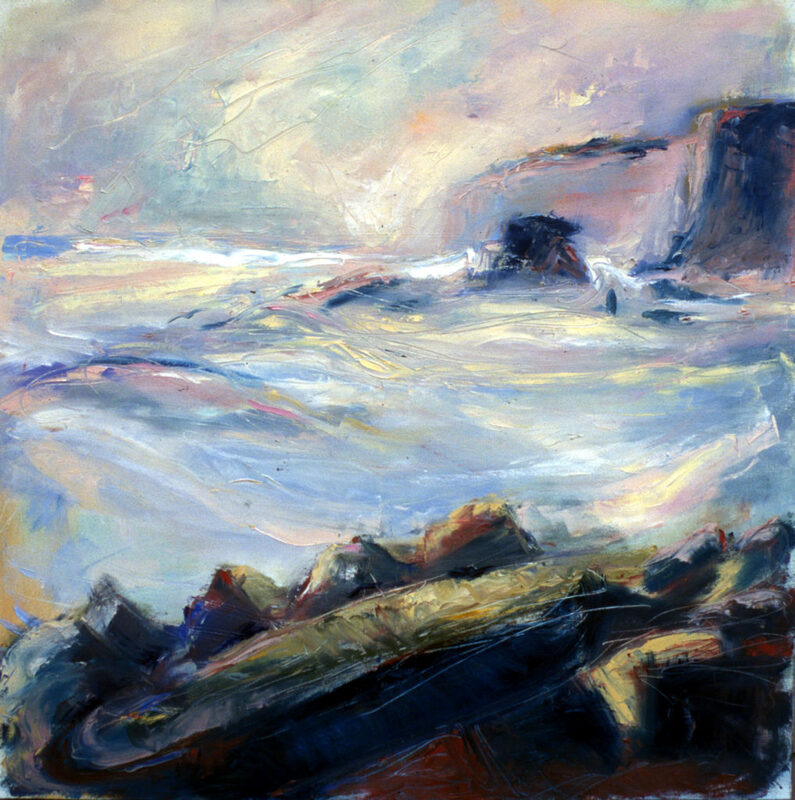 Depicts the rocks at Marsden Bay. It’s hard to define my work as I have changed so much over the years both in style and subject. I have sold my work professionally for over 30 years and in such a timescale things change drastically in every way or I feel they should do! Always learning, always growing, always changing, always new things to see and paint.! 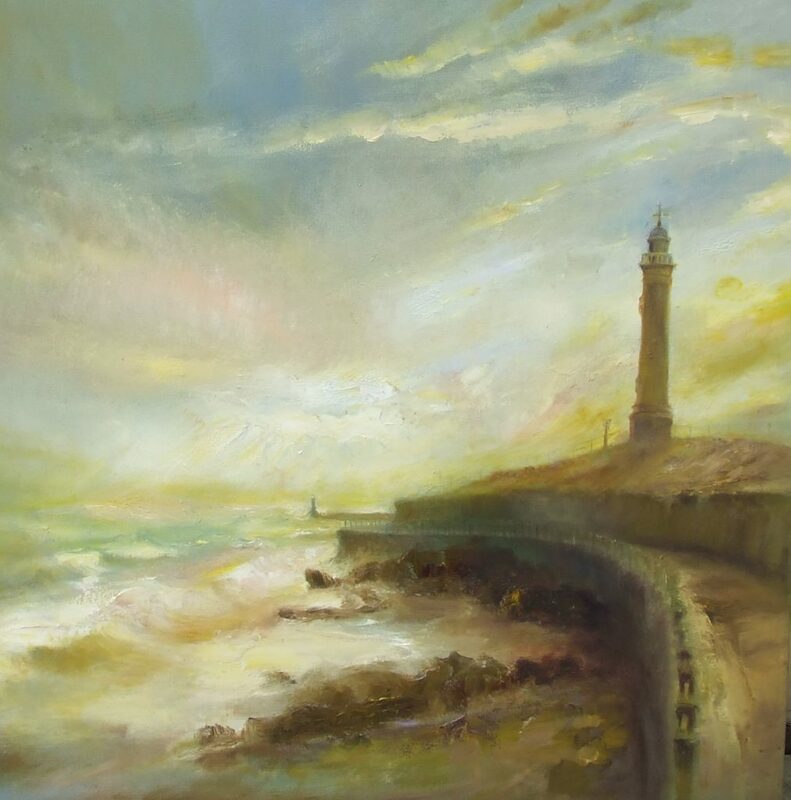 To give a recent point of focus I would say I have been a seascape artist for the longest time. Back when I was younger I painted portraits and then went on to large abstract paintings that were purely involved with colour and form. I loved Cezanne and Rothko at the time and they influenced me a great deal. 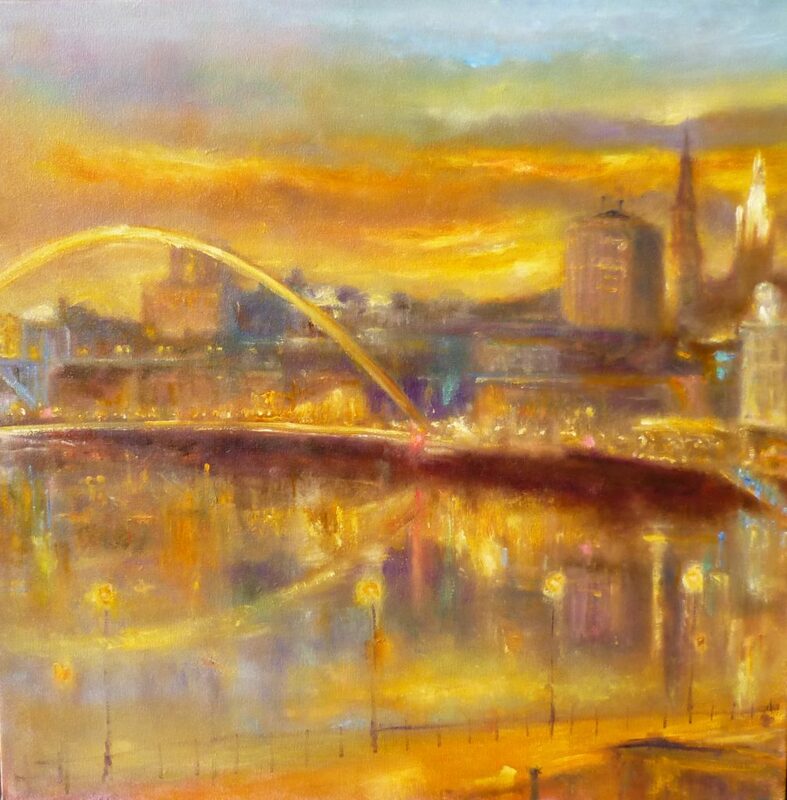 ‘City Life’ Kate Van Suddese, the Gateshead Millennium Bridge. Tell us how you first started out as an artist. 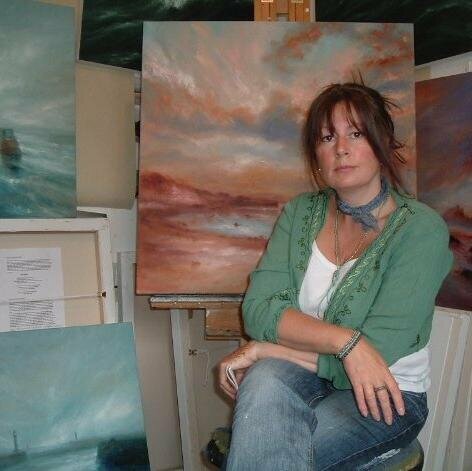 I first started out after Uni in my early 20s painting portraits. I worked lots of part time jobs to keep funds going so I could paint. I dropped in and out of Art degrees and courses as the mood took me, travelled around a few places. Always painting and always trying to get my work into galleries etc. and always working if I ran out of cash. Eventually I built up a selection of galleries who exhibited my work nationally including the Biscuit Factory, Red Rag Gallery, the Leith gallery. And things went on from there. In 1993 my mother died and it had a profound effect on my painting world. I began to paint the coastal world around me. It was a place where I found peace and the raw energy and sense of limitless space was comforting. A bridge to another world. 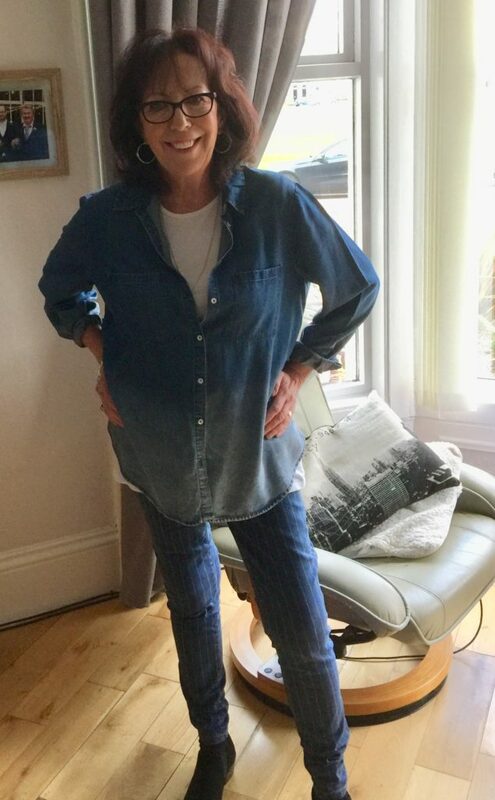 Mum loved the North East coast and I found myself wandering around in her footsteps, reliving the childhood memories I had of days at the beach with my family. I ended up painting a whole series of seascapes featuring huge crashing waves and local landmarks all with a link in my mind to my mother and my family. From then on I have been painting my beloved Northern coastline in all its glory as a tribute to both my mum and the whole Northern ethos. Warmth, family, roots, history: who cannot but be inspired by our beautiful coast? The variety and breadth of the coast from Redcar up to Amble etc and beyond is amazing. The beauty and wide expanse of beach and white light of Bamburgh is just breathtaking. Both Lindisfarne and Dunstanburgh with their history and isolation are magnets for people seeking open space and a sense of belonging. When you see the regeneration of the coal coast it just astounds with the changes that have happened over recent years. There are still the scars of the mining industry within its folds but the beaches and coastal paths are now well on their way to their own form of well-hewn beauty. Its good to keep a sign of past times too, to remember life as it was. I spend a fair bit of time at Blast Beach , Seaham, looking for glass from the old glass works and painting the crashing waves at Noses Point. 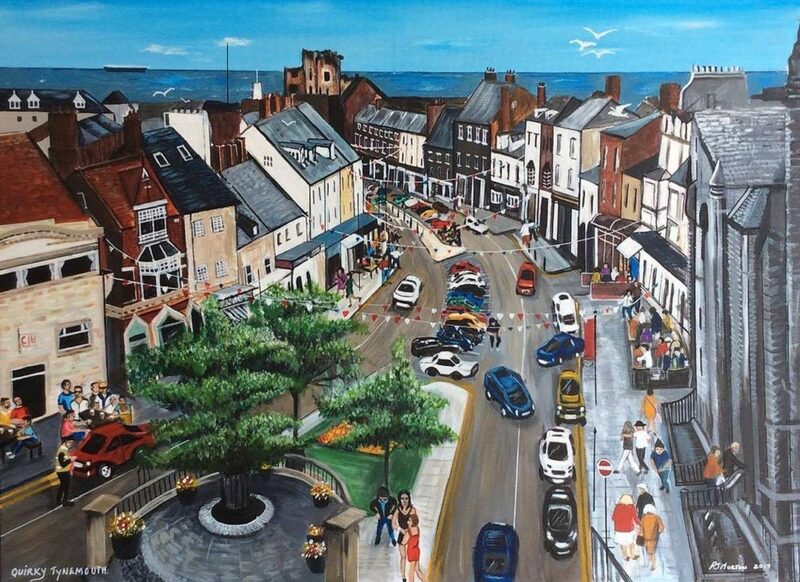 I spend every weekend at Tynemouth Market with my paintings and prints and have come to love the coast in the area. I set off early to watch the early sun from different vantage points before I go to work at the market. Sitting watching the early waves come in at North Shields fish quay and the Groyne is One of the most peaceful and happy things I like to do. It never fails to make me want to paint it. 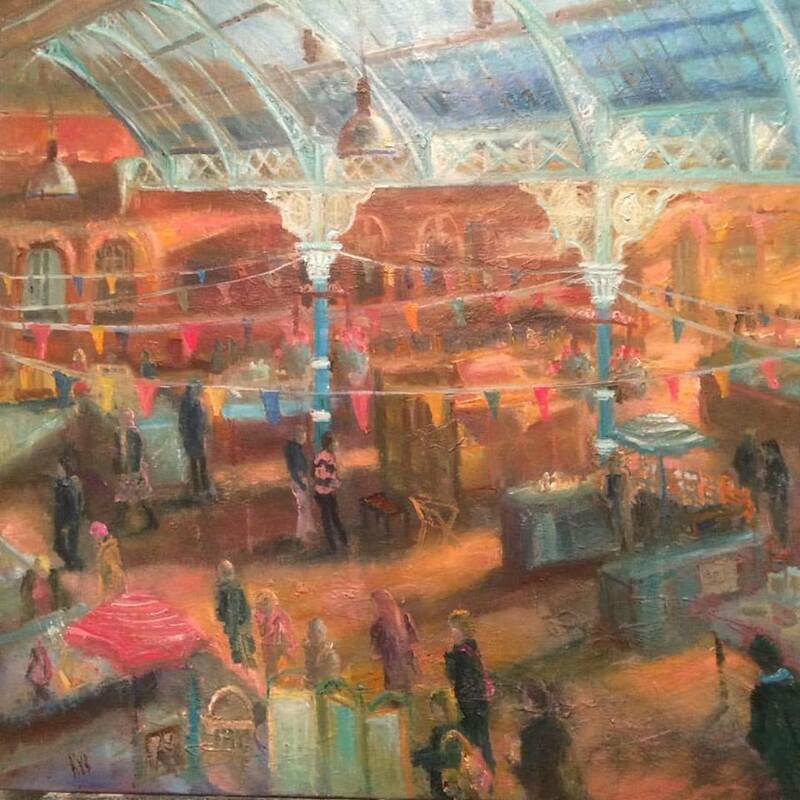 Kate Van Suddese’s ‘Treasures Hunters’ depicts the fabulous market at Tynemouth. All the way along, St Edwards Bay, Longsands and our magnificent St Mary’s Lighthouse is a treasure trove of inspiration, both through memories of times past and present day happiness. In rain or shine, calm or storm. 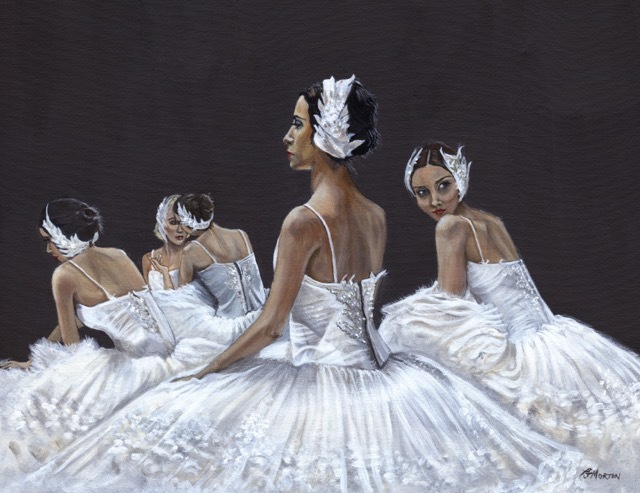 I paint in lots of different styles, it depends on how I feel at the time and what the image needs. But mainly I am an oil painter, using canvases both tiny and large. I adore Turner and Atkinson Grimshaw and much of my work has a feel to it of both. Its not deliberate, I just feel that my love of light and beauty is so ingrained that is just comes out as it does because that seems to be the only way I can try to capture what I want. Turner’s use of light and colour and almost abstract form was far advanced for the time and seems to me to just capture the essence of another world with its sense of beauty and translucence. 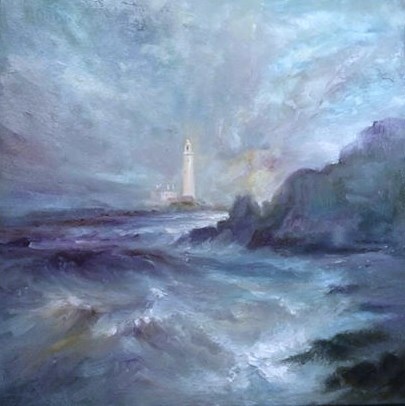 ‘In The Soft Light of Morning’ St Mary’s Lighthouse near Whitley Bay. Kate Van Suddese. 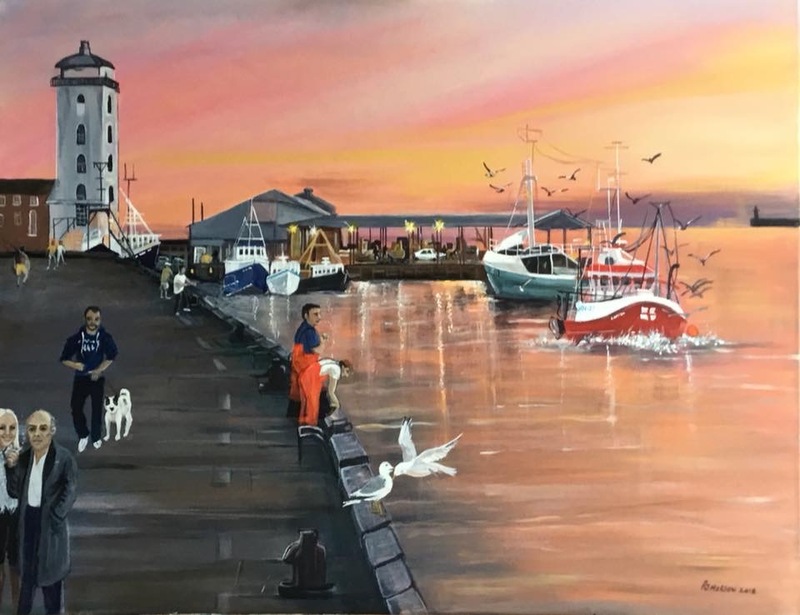 In painting local landmarks and local seas I also wanted to find a way to paint beauty, as to me the sense of place and belonging is a link to love and life. I try to find the beauty in whatever it is that has inspired me to pick up my brush and paint it. As I said the focus of my work is mainly as a seascape artist but recently I have enjoyed creating small series of fantasy works. All have to be beautiful in one way or another though. Story telling is something I like to do and to tell a story with a painting is a satisfying way of making magic from nothing. ‘Night Life’. 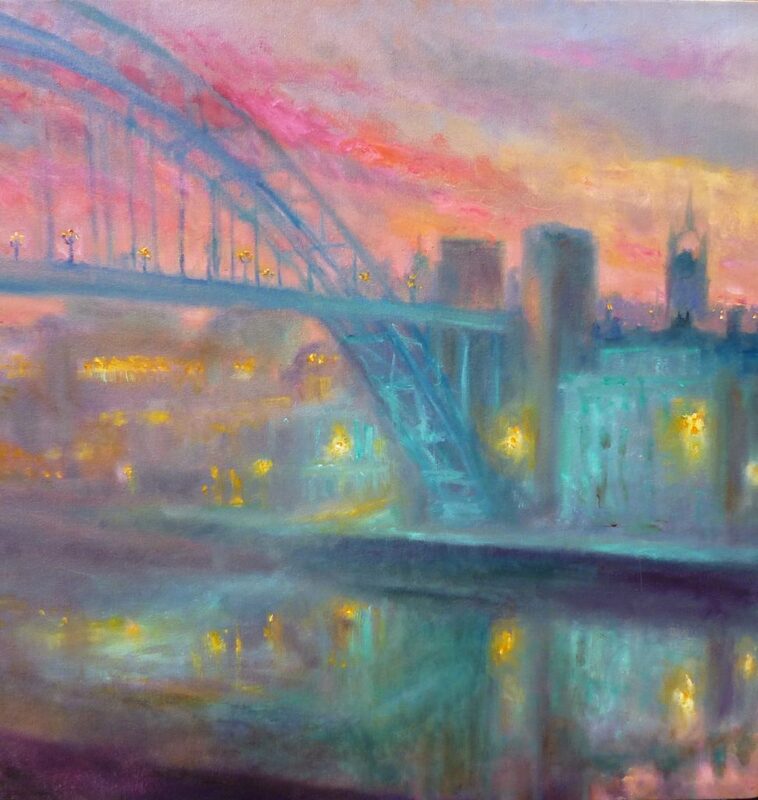 The Tyne Bridge, Kate Van Suddese. Everything inspires me. The world around me, words , poems, colours, stories, memories, sadness,happiness, my family, my love of the sea and my love of the North and its history and encompassing nature. Which other artists or photographers do you admire? ‘The Sunshine Bay’, Cullercoats. Kate Van Suddese. Be yourself, paint what you want and keep experimenting and changing. Decide which way you want your career to go, what is the most important thing and go for it . find which side of the fine line between Art and Commerce it is that motivates you and make your choices accordingly. Its hard being an artist for the love of it if you cant make enough money to buy paint and pay your bills. Just keep going and don’t let the knock s set you back, there will always be someone who loves your work and someone who doesn’t. Roker Lighthouse. Kate Van Suddese. My most challenging creation hasn’t happened yet. Everything is hard, I call it a bitter sweet occupation, the love and pain involved in creating anything is all encompassing whether it is 2D or 3D, for yourself or a commission. As far as ambitions for the future goes: I just want to paint! 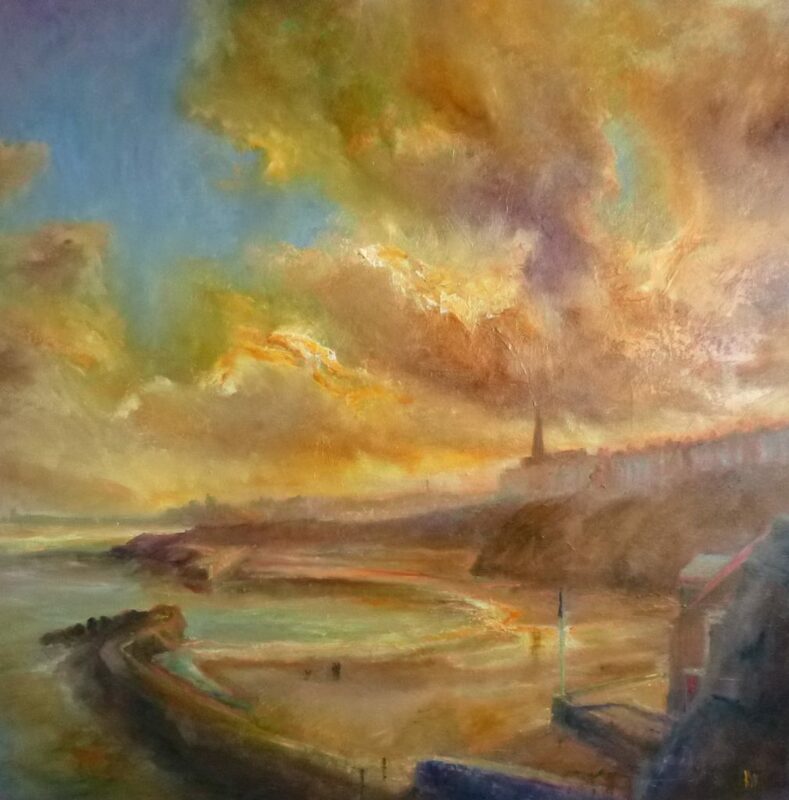 DAVID SIMPSON talks to Tynemouth-based artist Pam Morton in the latest in our continuing series of blogs focusing on the region’s artists, photographers and creative people. Illustrative bold atmospheric and as realistic as I feel it should be. I studied at Newcastle College of Art in the 1970s however I only started to paint 3 years ago when I retired. Beauty, emotion, memories of my subject. I live in Tynemouth and it’s such a beautiful place full of character and incredible landscape with a thriving social life. My very first landscape “The Longsands” and “Quirky Tynemouth” I like to think they remind people of their days in Tynemouth whether it’s a walk along the beach or socialising in Tynemouth Village. Practice and feel free to paint if it inspires you, also persevere even if you feel like giving up. Marcel Witte is a Dutch painter who paints in such detail and every painting has a message. My favourite photographer is Coastal Portraits by Snappy photographer. That people will continue to like my work.